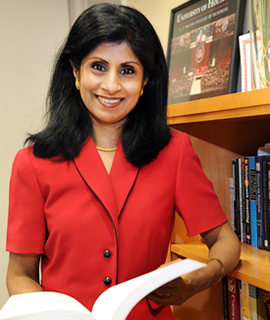 Latha Ramchand, a noted academician and expert on international and corporate finance, has been appointed as dean of the C. T. Bauer College of Business at the University of Houston, John Antel, provost and senior vice chancellor/vice president of academic affairs announced Wednesday. Ramchand began serving as interim dean in early March 2011 after Arthur D. Warga, who had been dean since 2001, stepped down from the position. Warga passed away Aug. 7, after a valiant six-and-one-half-year battle with brain cancer. “I look forward to building on the work done by Arthur — from building nationally ranked programs and attracting the best researchers to investing in student services and growing the Bauer Honors program, he was – as I often reminded him – easily satisfied with the very best,” Ramchand said. Ramchand has previously served as the college’s associate dean of Programs and Administration, and associate dean of Graduate and Professional Programs. In the latter role, she oversaw all of Bauer College’s post-graduate and professional programs, including faculty and staff who serve the following areas: Master of Business Administration (MBA), Executive MBA, Master of Science in Accountancy, Master of Science in Finance, Doctor of Philosophy (Ph.D.) and a variety of professional programs including Energy Certificate Programs. As associate dean of Programs and Administration, she was responsible for oversight of all of Bauer’s academic programs. She is also a professor of finance at Bauer College and teaches in the areas of corporate and international finance and risk management. She received her Ph.D. in finance at Northwestern University, where she attended the Kellogg Graduate School of Management. She is a gold medalist in economics from Bombay University, where she graduated with a master’s degree in Economics. Ramchand has taught in the MBA programs at the Kellogg Graduate School of Management, Northwestern University, the University of Houston and the Indian School of Business. Her research interests include international and corporate finance, mergers and acquisitions, and corporate governance and leadership. She has won several awards for her publications, including the Best Paper Award in International Finance from the Financial Management Association. She is a recipient of the UH Faculty Excellence Proclamation awarded by the Houston City Council (1995). Her publications have appeared in prestigious finance journals and she has presented her work at various national and international conferences. She is a CFA charter holder and is a member of the Houston Society for Financial Analysts. Bauer College’s graduate program is ranked 12th in the nation and fifth among public universities for producing CEOs of S&P 500 companies, according to Bloomberg Markets. The Princeton Review and Entrepreneur magazine have ranked the college’s Wolff Center for Entrepreneurship in the top two undergraduate entrepreneurship programs in the nation since 2007, with a No. 1 ranking in 2008 and 2010. Bauer is ranked among the top 20 public EMBA programs in the U.S., according to a Financial Times 2010 ranking. Story originally published at http://uh.edu/news-events/stories/2011articles/Sept2011/0907Bauer.php. Hearty Congratulations on your achievement and appointment as the new Dean of Bauer College of Business. Rick and I wish you well and success in this new role. We wish for great things to happen to our college under your directorship.